Come ride with us through the beautiful Lehigh River Gorge. This is a 3 to 5 hour downhill biking day trip. You ride along the slight downhill grade of an abandoned railroad bed and follow the river all the way through the Lehigh Gorge State Park. We will explore the wonders of Boulder Field. While this is a short hike in distance it will take some time to cross the boulders. Once you are on the other side there is a short loop trial back around the field to the vehichle. Afterwards we will drive over to enjoy a dip in the water at Hawk Falls. Hawk Falls Trail is a 0.6 mile trail that begins in rhododendron thickets and hugs the side of a hill down to Hawk Run. A large footbridge crosses the creek. The trail bears right at Mud Run, wanders through a tunnel of rhododendron and ends with a view of Hawk Falls, a natural 25-foot waterfall. You will find here the other group that traveled in the van. You can take a quick dip in the water or just cool off your feet before heading back up the trail to PA534 back to van home. Boulder Field itself is one of those places you have to see to believe. If that's all you see when you come to Hickory Run, you're missing a lot, but it is one of the most popular things to see. No matter how someone tries to describe it, you have to see it for yourself to truly understand what makes Boulder Field so unique. Measuring approximately 400 feet by 1,800 feet and at least 12 feet deep, this feature is the largest of its kind in the Appalachian Mountains of the eastern United States. The surface of the boulder field is very uneven (you will need to be nimble) and in many places the relief from one boulder to the next is as much as 4 feet. The field is made up of a jumbled assortment of loosely packed boulders generally less than 4 feet in diameter, but sometimes as large as 25 feet in length, and there is no fine material such as sand or clay filling the space between the boulders. We will cross over Boulder Field (see description above) to find the trailhead of the Boulder Field Trail. Then we hike downhill 3.5 miles along modest elevation change and the rocky nature of the trail near Boulder Field makes the 3.5 miles seem longer in distance. This trail runs through sections of hemlock, spruce and beech forests. Bears, owls, white-tailed deer, turkeys, snowshoe hares and ruffed grouse are sometimes encountered along the trail. Skytop Lodge’s most popular hiking and cross-country skiing trail begins at a small parking area across Route 390 from the Ski Slopes/ Adventure Center parking lot. The main trail is about one and a half miles round trip, completely level and follows the east shore of the Leavitt Branch after crossing a footbridge near the parking area. The highlight of the trail is its end point – the magnificent Indian Ladder Falls. Beautiful at any season, this 3-level waterfall was formed where the Leavitt Branch carved through layers of sandstone and shale on its descent from the Pocono Plateau. All along the stream below the falls there are pools where brook and brown trout can be seen. Large wood turtles and 4 kinds of stream salamanders – dusky, 2-lined, spring and northern red – inhabit the waters along with a great variety of aquatic insects. Spend part of your day at Promised Land State Park. This park is approximately 3,000 acres in size; the park is situated in the Pocono Plateau, 1,800 feet above sea level, and is surrounded by 12,350 acres of state forest and a natural area. The forest consists primarily of beech, oak, maple and hemlock trees. Two lakes and several small streams add to the park's outstanding scenic beauty. Promised Land Lake is 422 acres and Lower Lake is 173 acres. There is a large beach area on the main lake to enjoy a swim and relax. Boat rentals are available just a short hike away. For those who would like to hone their Orienteering skills there is a compass course laid out nearby to try. There are about 50 miles of hiking trails in Promised Land State Park and the surrounding state forest, providing access to many natural scenic places. A short distance from the beach area is Little Falls Trail or short drive to walk a loop around Conservation Island. Experience a train ride into the Lehigh River Gorge from Jim Thorpe. 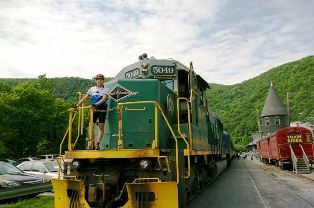 It’s a 16-mile, narrated, 70 minute round trip; we will ride the former mainline of the Jersey Central Lines leaving Jim Thorpe. The line swings onto the former Lehigh Valley main line before passing Glen Onoko. From here the Jersey Central you will see high-rising cliffs, mountain scenery, and wildlife surround the train along the forest route. We follow the winding Lehigh River, rounding curve after curve until we reach Old Penn Haven. Once back in Jim Thorpe we take in a lunch at one of the many restaurants in town. Start the day visiting Quiet Valley Living Historical Farm which is a 19th century Pennsylvania German farm dedicated to the preservation and education of rural farm life. See period-dressed "family" members re-enacting the life of the original Pennsylvania German family who lived on the farm from the 1760s to 1913. Visit Sorrenti’s Cherry Valley Vineyards Winery & Pizzeria where we have a wine and cheese pairing. Then enjoy a pizza from a one of a kind Le Panyal wood fired brick oven. Limit 12 people. Additional Charge $24.50 includes Wine&Cheese Tastings, 2 slices of Pizza, and entrance fee to Quiet Valley.